Balancing Jane: Fighting the Culture Wars on Facebook: Important, Stupid, Both? Fighting the Culture Wars on Facebook: Important, Stupid, Both? So, I have this acquaintance (a former co-worker) that posts a lot of conservative political opinion and questions on his Facebook page. Though I disagree with him on almost everything he posts, I think it's really important not to increase the effects of the online echo chamber. I don't de-friend people for posting things I disagree with, but I try not to get engaged in Facebook culture wars, either. This acquaintance posted something about how he thought the parodies of Rick Perry's campaign video "Strong" were funny, but he didn't get why people were offended in the first place. 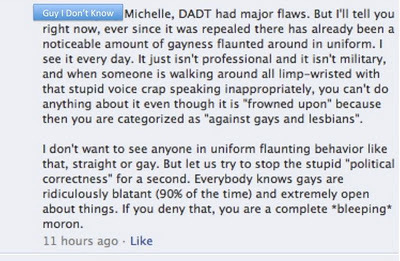 I responded to say that it was offensive because DADT was a horrible policy and when Perry suggests that it shouldn't have been repealed, he's insulting the hard-working gays and lesbians in the military. Don't Respond Because It's Pointless- I highly doubt that anything I said changed this guy's mind about gay people serving in the military. And I know for a fact that nothing he said changed my mind. Maybe it's not worth having the conversation because we're basically just "talking" to "hear" ourselves (typing to see ourselves, whatever). Don't Respond Because It Promotes More Bigotry- Responding to bigotry could give the person spewing it the motivation to spew some more. What might have been an otherwise silent, solitary opinion now has an outlet for further development. Respond Because, Hey, Maybe It Makes a Difference- Then again, people do change their points of view over time. Maybe these little conversations add up and make a difference. Respond Because It's Cathartic- Who cares if it makes a difference or not? His comments offended me, and it felt good to get my response off my chest whether it was heard or not. Respond Because Facebook is a Semi-Public Forum- So maybe I'm not going to change Guy I Don't Know's mind, but other people are reading this exchange, and maybe it makes a difference to someone else. So how do you handle these kinds of conflicts? Is it worth responding? Do you make that decision on a case-by-case basis? I have been defriended by a few people because of my liberal political views. I have also defriended a few people whose bigotry was just too much to handle. I do tend to deal with it on a case by case basis but most of my friends know I won't put up with bigotry of any shape or form and I am not likely to be friends with people who express those sorts of view in the first place. I actually have two FB accounts. One is family and old school friends and people I have worked with etc. I rarely if ever use it. The other is where I have my real friends and my real connections. I use this account daily. The two accounts started because I have a chosen name and then the name everyone knew me as growing up etc. The difference sort of evolved from there. I haven't had to deal with a FB friend saying blatantly bigoted things. I probably would defriend in that case, mainly because I wouldn't want to be associated with that. Most of my experiences have been FB friends saying things that I just disagree with (but aren't really offensive), them saying things that do offend me, but aren't blatant and probably weren't intended to offend, or their friends (who I don't know) saying blatantly offensive things (as was the case here). I can see how it's hard to decide when to fight a culture war and when not to. Sometimes, it helps if you attempt to see through the other person's eyes. Did they say that a person being gay/lesbian should not be in the military? 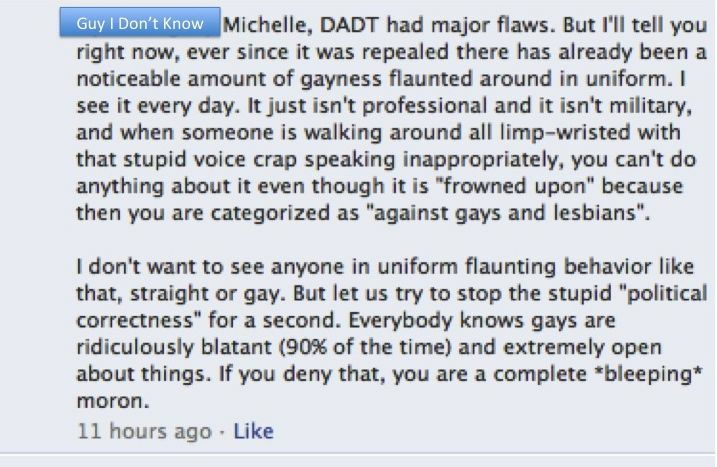 They even stated that DADT had flaws in it, thus indicating that even they didn't agree with it. They also said certain behavior wasn't professional. I could be way off, but I'm making a guess anyway. To this person, when a person is doing their part as a member of the military, regardless which branch they are in, discipline and that sense of duty should be in effect while a job is being performed. This is why you don't see men and women in uniform who also have piercings on and why those who are serving have their hair cut very short. It all goes back to discipline. I'm also going to guess that this person had no problem with whatever their fellow men and women at arms did on their own free time, but again, I could be wrong (they did indicate that certain behaviors annoy them... and if they're annoyed by said behaviors when members of the military are enjoying their own free time, then they need to honestly get over themselves). Oh this is a good post. I've run into this a few times, mainly because I feel a need to respond to offensive and sometimes inaccurate copy-and-paste facebook posts (lately it's a lot of the 'war on christmas' crap). I just sometimes don't feel right if I don't respond.. like I don't have the courage to stand by my convictions, so I may engage, and try to remain civil and if I don't make any headway I might bow out of a debate. Sometimes I'm surprised I haven't lost more online friends due to my views. I second your facebook confusion! This has come up a bit recently and i basically go through the points you do when debating with myself as to whether or not to respond. To be honest i haven't come to a general conclusion yet. The whole thing is just so incredibly unnatural, to get across a complex and contentious point in print really loses out on a whole lot of intricate communication like tone, expression, whatever. I think all that makes it that much less likely someone will change their minds (and i also worry that it is kind o cowardly to speak in a way in print that i would not in real life). So i tend to go non-engagement. But sometimes the post is really out of hand and i do feel a responsibility to get the opposite view out there, primarily if i think it is really damaging or dangerous to let it go unchallenged, like when it involves racism or other types of bigotry, or victim blaming, or xenophobia or whatever. I like the point about it being a semi-public forum. It seems more worthwhile looking at it that way. Whether you change his mind or not, I believe it's important to speak out when someone says something blatantly biased/bigoted/sexist. Refraining from comment is to convey silent agreement. I don't engage in flame wars and will disengage if it seems to be devolving into one. I think you handled your response very well.